The first step to purchasing a Landschaft German Shepherd puppy. Is a telephone interview. Potential puppy purchasers are carefully screened for suitability. As lifetime homes for our Landschaft German Shepherd puppies. It is important that dog and owner are compatible. Landschaft German Shepherds cares about your satisfaction. And will assist you in selecting the puppy that is right for your unique situation. Landschaft is available as a resource for our clients for the life of their puppy. We have a waiting list for our German Shepherd puppies. So please plan ahead for your special companion. We prefer a personal interview. To better help you select the right puppy for your individual needs. Landschaft working line German Shepherds does not agree to sell our puppies lightly. We feel that the buyer should enter into the commitment of a new puppy. With the same forethought. In order to secure an outstanding partnership for life. At Landschaft we breed uniform litters that are consistent in type and temperament; dogs that have sound nerves, exceptional drives, correct structure, good health, and a strong desire to please. Landschaft specializes in breeding German Shepherd puppies for dog sport competition, Search and Rescue, law enforcement, and above all, outstanding family companions. Good puppies begin with good breeding choices. Our breedings are carefully planned to ensure the highest quality puppies, and all of our puppies are whelped, raised and socialized in our home. Landschaft German Shepherd puppies receive a great deal of hands-on personal attention and imprinting with exposure to all of the day to day activities their new world has to offer. By the time a Landschaft puppy is ready to go into his or her new home they have already been exposed to a variety of flooring, household noises, people of all ages and backgrounds, and other types of animals. Landschaft feels that it is not ethical or moral to breed any dog without hip certification. A good breeder would never even think of it! We also feel that if you are breeding German bloodline dogs, you should at least attempt to follow the German standard by breeding dogs with hip certification, working title, breed survey, and conformation rating whenever possible. Prospective buyers should educate themselves as to what makes a reputable breeder and insist on quality. A breeder should ask as many if not more questions of the buyer than the buyer does of the breeder. A written contract including guarantees should be given to the buyer upon purchase. The contract should include a comprehensive health and hip guarantee. The hip guarantee should not just cover crippling hip dysplasia but should guarantee the puppy to OFA certify at two years of age and should give the buyer adequate time to obtain the OFA diagnosis. Anything less is a bogus guarantee. OFA does not certify a dog clear of hip dysplasia until age minimum age of TWO! A breeder should also gladly answer questions and willingly supply references if requested. Buying a puppy with a strong pedigree helps ensure trainability. The number of Schutzhund titled dogs in the pedigree is an indication of the merits of the litter as a whole. It is important to locate a puppy that comes from bloodlines that have proven themselves on the schutzhund field. Working German Shepherds have solid nerves and are healthy and hardy for the longevity of a successful working career. There is a false assumption that working dogs do not make good family pets. Landschaft German Shepherds possess correct temperament with the solid nerve combined with drive necessary to excel in dog sports or police work, yet are gentle enough to play with a room full of children. 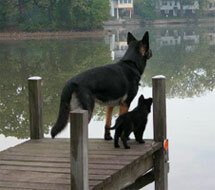 At Landschaft, we are dedicated to the German Shepherd Dog breed and are passionate about our dogs. Every reputable and legitimate breeder should have a “purpose for breeding”, a set of goals on what it is they are trying to accomplish with their breeding program. To simply breed a German Shepherd Dog because they have the reproductive capability to do so is offensive. Our goal is to produce a healthy, performance oriented animal, that excels on the sport field as well as in the home as a family companion. 1. Been on 7 different types of surfaces: carpet, concrete, wood, vinyl, grass, dirt, gravel, wood chips, etc. 2. Played with 7 different types of objects: big balls, small balls, soft fabric toys, fuzzy toys, squeaky toys, paper or cardboard items, metal items, sticks, hose pieces, etc. 3. Been in 7 different locations: front yard, back yard, basement, kitchen, car, garage, laundry room, bathroom, crate, etc. 4. Met and played with 7 new people: include children and older adults..
5. Been exposed to 7 challenges: climb on a box, go through a tunnel, climb steps, go down steps, climb over obstacles, play hide and seek, go in and out of a doorway with a step up or down, run around a fence, etc. 6. Eaten from 7 different containers: metal, plastic, cardboard, paper, china, pie plate, frying pan, etc. 7. Eaten in 7 different locations: crate, yard, basement, laundry room, living room, bathroom, etc. A Breeder’s Poem I love my little puppy; she makes my house a home. She is my very sweetest little friend; I never feel alone. She makes me smile; She makes me laugh; She fills my heart with love . . . Did some person breed her, or did she fall from above? I’ve never been a breeder, never seen life through their eyes; I hold my little puppy and just sit and criticize. I’ve never known their anguish; I’ve never felt their pain, the caring of their charges, through snow or wind or rain. I’ve never waited the whole night through for babies to be born, The stress and trepidation when they’re still not there by morn. The weight of responsibility for this body in my hands, This darling little baby, who weighs but 60 grams. Should you do that instead of this . . . or maybe that was wrong? Alone you fight and hope, one day, he’ll grow up proud and strong. You pray he’ll live to bring great joy to someone else’s home. You know it’s all just up to you; you’ll fight this fight alone. Formula, bottles, heating pads, you’ve got to get this right, two-hour feedings for this tiny guy, throughout the day and night. Within your heart you dread that you will surely lose this fight, To save this little baby, but God willing . . . you just MIGHT. Day one; he’s in there fighting; you say a silent prayer. Day two & three, he’s doing well, with lots of love and care. Day four & five . . . he’s still alive; your hopes soar to the heavens. Day six he slips away again, dies in your hands, day seven. You take this little angel, and bury him alone. With aching heart and burning tears, and an exhausted groan, You ask yourself, “Why do this? . . . Why suffer through this pain?” Yet watch the joy your puppies bring, and everything’s explained. So, when you think of breeders and label them with “Greed,” Think of all that they endure to fill another’s need. For when you buy your puppy, with your precious dollars part, You only pay with money . . . while they pay with their heart. …. Author Unknown….